With Halloween only a week away, our spooky travel series takes us to London, England this week to explore the hidden spooky secrets of the Tower Of London. London has such an amazingly diverse and old history. So many things, good and bad, happened during this town’s existence that there is no surprise that there are numerous stories of ghosts wandering around the city. Today we are going to focus on the spirits that have taken to roaming the halls and tormenting those who reside and visit the Tower of London. Her Majesty’s Royal Palace and Fortress, the Tower Of London is a fascinating place to visit and almost a thousand years old! 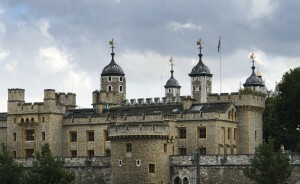 Many people were tortured and killed while being imprisoned in the Tower of London, Hampton Court Palace, etc. It is said that the likes of Anne Boleyn, Henry VI, Lady Jane Grey, Margaret Pole, the Prince in the Tower and even a grizzly bear roam the halls of this magnificent structure. While some of you may be skeptical of the existence of ghosts, some of the Yeomen Warders even deny their existence; many will gladly take you on a twilight tour, sharing eerie experiences. One of the specters was even captured on CCTV! Anne Boleyn haunts various places in the Tower of London. It has been seen near the Queen’s House, the Chapel Royal of St. Peter ad Vincula, and wandering around the corridors of the Tower, headless! Anne Boleyn is perhaps King Henry VIII’s most infamous wife. She was executed for treason after Henry VIII divorced her for not providing a legitimate heir to the throne. Up until this point in history, only men could rule England. Anne Boleyn did have a daughter who ended up becoming Queen Elizabeth I. Like Anne Boleyn’s listless spirit, Lady Jane Grey and her husband Lord Guildford Dudley are said to roam the Tower of London. Lord Dudley has been seen and heard in Beauchamp Tower where he was held before his execution. He is said to have scratched ‘Jane’ into the wall of his cell. Some claim that they hear screams and sobs coming from the room where Guy Fawkes was kept the night before his execution. The ‘Princes of the Tower’ is a very famous murder mystery dating back to 1483 when King Edward IV’s sons Edward V & Richard, Duke of York disappeared. While some of the Yeomen Warders deny the existence of the many spirits in the Tower of London, the majority does admit there are some eerie things about the complex and its grounds. There are also many stories that involve these highly trained, manly guards who are frozen with fear, shaking, talking to non-existent beings, and fainting! These stories barely scratch the surface of the creepy things that happen in the Tower of London. When you’re in London, make sure you stop and explore the Tower of London. You never know who you might run into! This entry was posted on Thursday, October 24th, 2013	at 12:57 pm	. You can follow any responses to this entry through the RSS 2.0	feed. Both comments and pings are currently closed.